Is your website or blog infected with malware or trojans? You can easily check for the same by accessing Google safe browsing diagnostic page for your website URL. 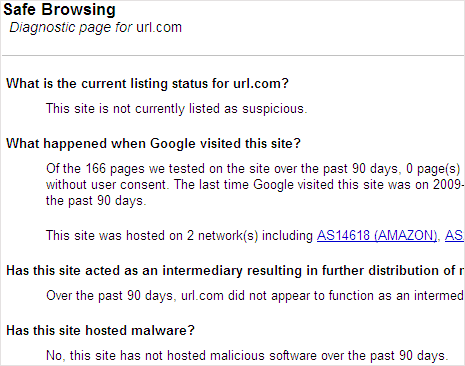 Google display report of possible malware infection on special webpage for every domain URL in its index. It shows the current status of website in Google index as suspicious or OK. Replace URL.com with your actual website or blog URL. Incase infection has been found on your website, clean up the infection and then contact Google using reconsideration request option in Google Webmaster tools. Explain in details what happened and what steps you have takes to remove infection reported by Google. So be safe and stay updated with health of your website using Google Safe browsing diagnostic page.